With its storybook characters, elaborate sets, joyous, happy score and charmingly animated wooden soldiers, BABES IN TOYLAND (known also as MARCH OF THE WOODEN SOLDIERS) has captured the hearts of many children and adults alike over the many decades it has been with us. Though this musical comedy has been revived many times on stage, and was remade and re-adapted several times over the years on film, there is no little doubt that when people speak of BABES IN TOYLAND, they usually mean the Hal Roach classic from 1934 starring the comedy team of Stan Laurel and Oliver Hardy. "Bigger and better" being the never-ending rallying cry of hungry producers, Hamlin and Mitchell decided to create another fairy tale for the stage. They came up with a story (if it can be called that) filled with a veritable Who's Who of Mother Goose: Little Miss Muffett, Little Bo-Peep, Tom-Tom the Piper's Son, Little Red Riding Hood, and more. Glen MacDonaugh, who had previously worked on THE WIZARD OF OZ, wrote the libretto and famed composer Victor Herbert (pictured at right) was called on to write the music. 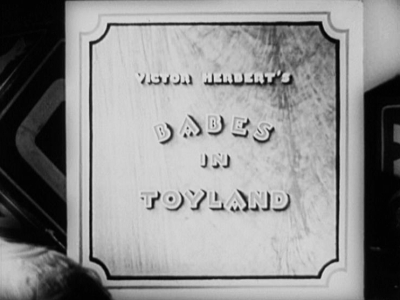 The "anything goes, story be damned" style of THE WIZARD OF OZ worked so well that BABES IN TOYLAND, the title chosen for the "sequel", was fashioned as another nearly plotless musical comedy revue. What little story there is concerns Contrary Mary and her brother Tom, and the evil Barnaby's efforts to do... well, something or other, evil no doubt. What matters is that the bulk of BABES IN TOYLAND took place in a magical world inhabited by storybook characters dressed in gorgeous colorful costumes, a world where huge black bears fought giant spiders, and where everyone sang or played beautiful Herbert melodies such as "Don't Cry, Bo-Peep", "Hail to Christmas", "March of the Toys" and the eternal "Toyland". BABES IN TOYLAND, hitting the New York stage in October of 1903, was another smash hit for Hamlin and Mitchell. Hollywood producer Hal Roach bought the film rights in 1933, and, not having much of a narrative to work with, provided his own story. He pictured his star comedians, Laurel and Hardy, as Simple Simon and The Pieman. 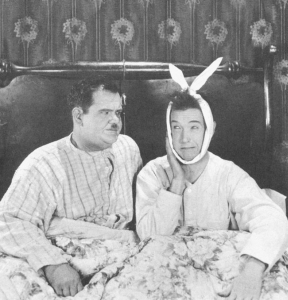 Having, in his own words, "worked like a sucker" on the story, he presented it to Stan Laurel, who immediately rejected it as unfilmable. Stan then presented his own plotline for the film, one which Roach considered "lousy" to his dying day. Eventually, Roach tired of arguing and washed his hands of the whole business, allowing Laurel to go ahead with his own story. Things were never been quite as friendly again between Roach and his star again, especially when Laurel's judgment proved right. Released in 1934 just in time for the Christmas season, BABES IN TOYLAND became a holiday hit, popular with audiences and critics alike. Operetta was nothing new for the Boys, having previously been comic relief in MGM's Lawrence Tibbett showcase THE ROGUE SONG and scoring a massive hit in their own version of Auber's FRA DIAVOLO, released in the U.S. as THE DEVIL'S BROTHER. What was new, however, was the epic scale of the entire project. Never before had the team been in a film of such grandeur. Though dismissed by L&H scholar Charles Barr as "scrappy", BABES IN TOYLAND, at the time, was almost as much of an extravaganza as the original stage production. From the remarkable Toyland set, to the cavernous innards of Bogeyland and their monstrous, if clearly zipper-backed, inhabitants, to the 100 six foot high wooden soldiers marching in unison to save the day, to the appearance of St. Nick himself (checking up on inventory six months ahead of time), BABES IN TOYLAND was the most visually dazzling feature Hal Roach had ever produced. Wisely, Roach and company worked in as many as Herbert's songs as they could. Beginning with Mother Goose stepping out of a book to sing the beautiful "Toyland", BABES IN TOYLAND did justice to Herbert's outstanding score. While the musical sections may bore some in today's more cynical audience, there is no denying the charm of the major setpiece "Never Mind, Bo-Peep" or the excitement "March of the Toys" brings to the film's final battle between the Wooden Soldiers and the marauding Bogeymen. Other songs featured included "Go To Sleep, Slumber Deep" and "Castles in Spain", both sung by baritone Felix Knight. Some songs not featured vocally, such as "Jane, Jane", wound up as background melodies. "I Can't Do the Sum" ("put down six and carry two"), sung by Mary Contrary in the stage play, became Laurel and Hardy's memorable thematic motif for this film. BABES also featured an effective and unique cast for a Laurel and Hardy film - not a James Finlayson, Billy Gilbert or Mae Busch to be found. Charlotte Henry, who had previously appeared as Alice in Paramount's all-star version of ALICE IN WONDERLAND, is a lovely Bo-Peep and Felix Knight hits all the right notes as Tom-Tom the Piper's Son. Florence Gordon, who had never appeared with the Boys before (but had been a favorite of fellow Roach comedian Charley Chase) makes for warm Mrs. Peep (aka the Old Woman Who Lived in a Shoe). Best of all is Henry Brandon as Silas Barnaby, "the meanest man in town", who, at the tender age of 21, creates one of filmdom's truly great villains. Deliberately overacting in the fashion of the stage play "The Drunkard" (which is where Hal Roach discovered the young actor), Brandon is a one man evil factory, ripping off Ollie's mustache one minute, kidnapping one of the Three Little Pigs the next, and unleashing the whole of Bogeyland on the sleeping Toyland in the film's final minutes. All while over-enunciating every word with dramatic gestures, as any good villain should. While all of this spectacle could have easily overwhelmed Laurel and Hardy, they make it their film as soon as they appear on screen. With a nod to Lewis Caroll, they play "Ollie-Dee" and "Stannie-Dum", who cohabitate the Shoe with Mrs. Peep and her daughter. Within seconds of their first appearance, Stan falls out a window, Ollie gets hit in the face with a door, and Toyland fades into the background as the Boys go through their familiar but welcome paces. It is Stan and Ollie who keep the story moving at every turn, and, though they do little here that they hadn't done in dozens of films before this one, their moments together have all the usual magic. Best of all are the all too few scenes they share with Brandon, who's crotchety wickedness provides a marvelously suitable contrast to the innocent antics of the true "babes in Toyland", Stan and Ollie. Through the years, BABES IN TOYLAND has been re-issued under many titles: TOYLAND, REVENGE IS SWEET and MARCH OF THE WOODEN SOLDIERS, which is the name the film is most widely known by today. It is also one of the most widely available Laurel and Hardy videos in the States, and was colorized twice. (Though many L&H fans are emphatically against computerized colorization, there seems to be a general consensus that if any film is going to be colorized, it might as well be this one). But like MGM's THE WIZARD OF OZ and Frank Capra's IT'S A WONDERFUL LIFE, the reputation of MARCH OF THE WOODEN SOLDIERS grew by annual repeats on television. During my own childhood, MARCH OF THE WOODEN SOLDIERS was not just another movie, but an event, as important as the annual airing of THE WIZARD OF OZ. Thanksgiving was simply not Thanksgiving without Ollie Dee and Stannie Dum. 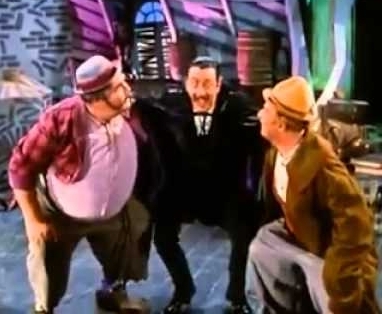 The colorized version still airs on local broadcast television in New York between Thanksgiving and Christmas, now coupled with the unrelated Laurel and Hardy short The Live Ghost. 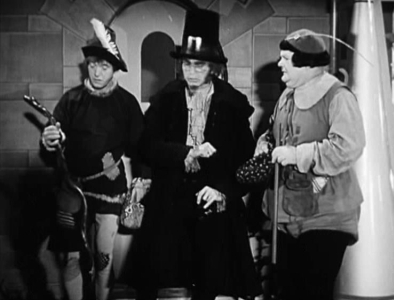 Other versions of BABES IN TOYLAND have been produced since Laurel and Hardy's classic. In 1961, Walt Disney released his own live-action version starring Annette Funicello, Tommy Sands and Ray Bolger. The film used Victor Herbert's music, but with jazzed-up arrangements. 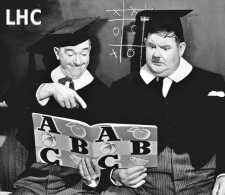 A Laurel and Hardy fan himself, Disney attempted to recreate them using the fine character actors Gene Sheldon and Henry Calvin as an obvious imitation of Stan and Ollie respectively. In 1986, a movie starring Drew Barrymore, Keannu Reeves, Pat Morita and Richard Mulligan aired on NBC television. 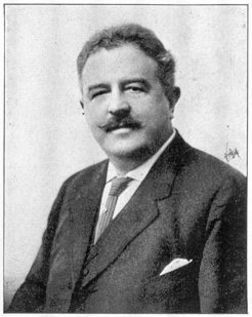 Unfortunately, most of Victor Herbert's music was jettisoned except for "Toyland" and "March of the Toys", with new songs by Leslie Bricusse replacing Herbert's classic melodies. In 1997, MGM released an animated home video version of the story, featuring the voice talents of Charles Nelson Reilly, Lacey Chabert, Christopher Plummer and Bronson Pinchot, among others. Again, most of Herbert's music was missing except for "Toyland" and "March of the Toys". None of the above three films came close to having the charm of the Laurel and Hardy version. All Laurel and Hardy films are recommended for children, but BABES IN TOYLAND is possibly the one L&H film no no child should grow up without. The original trailer for the movie urged 1934 audiences not to "send the kiddies - Bring them! You'll enjoy it as much as they will!" Copyright © John V. Brennan, 2013. All Rights Reserved.